Sat 4th XIarrow-rightCreated with Sketch. Wilkinson and Granger lead Brook home. 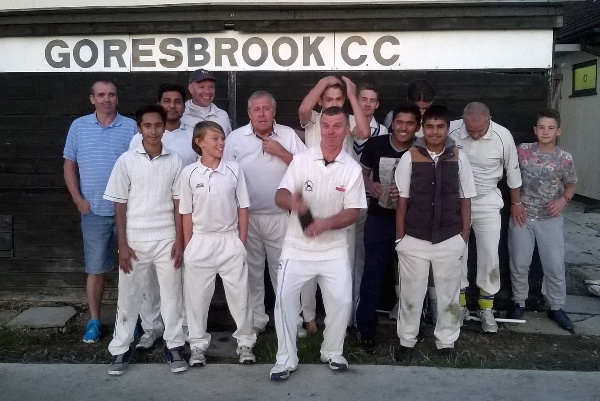 Goresbrook 4's returned to winning ways against Great Totham 3's at the M&B annex on Saturday. Fielding first , Owen Elsom made the initial breakthrough in the 5th over and Dapper Dan took 2 wickets in 2 balls in the 6th. Bobby Granger, Phil Thoufick and Andrew Pauling got a wicket apiece but the pick of the bowlers was Lee WIlkinson who grabbed three wickets to dismiss the visitors for 67. Brooks reply got off to a quick start with Atif Ali pulling to the boundary but he fell in the 2nd over lobbing softly to cover. However, Jo Wilkinson with 22, and Lee Granger with a career best 33 added the 63 runs required in 12 overs to see Brook home by a 9 wicket margin.